You know you’re jealous of Canada’s Prime Minister, Justin Trudeau: He insisted on a 50% female cabinet, listens to climate science, and does yoga on the regular. He’s like the opposite of Trump, and he’s right next door! But as handsome and cool as he is, Trudeau has a serious flaw: he supports Tar Sands pipelines – even though they violate Indigenous rights and make it impossible for Canada to meet its climate commitments. So this Valentine’s Day, we’re teaming up with friends at Stand.Earth and the Other 98% to send Trudeau a love letter telling him to stop supporting Tar Sands pipelines. Can you sign on too? For years now, Justin Trudeau has supported the Keystone XL pipeline, a project that would run through rural communities without the consent of local landowners. 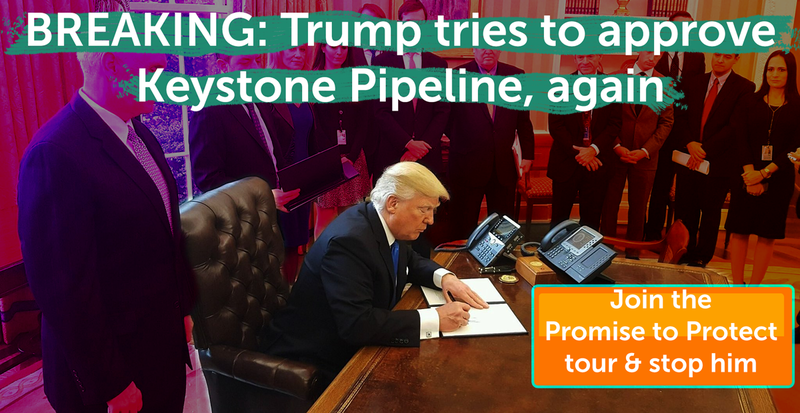 And within his first year in office, he approved two major pipelines – Line 3 and Kinder Morgan’s Trans Mountain pipeline – without the consent of local First Nations. Canada and Trudeau say they’re different than Trump and America. We all want to believe Justin can change, but to do it, he needs to keep fossil fuels in the ground. And to do that he needs to stop these dirty Tar Sands Pipelines. Trudeau is loved by progressives all over the world. But he needs to know that we’re not going to let him selfie his way out of his promises on climate and Indigenous rights. 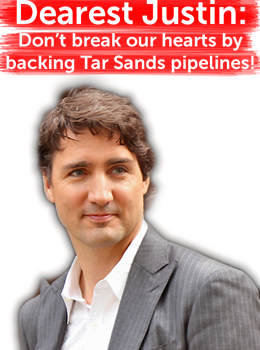 Send a message to the Canadian Prime Minister and tell him to cancel his pipelines and to take real action on Canada’s dirty Tar Sands. Header image by Alex Guibord. Happy winter solstice – if happy is what you want to call it. It’s been another rough week. Earlier this week the Republicans rammed through a disastrous tax bill that will (among many other bad things) give special tax breaks to pipeline builders, Arctic drillers, and other assorted fossil fueled ne’er do-wells. As I write this, they’re voting through a short term spending bill without doing anything about the DREAMers – who are at risk of being deported every week Congress refuses to act. All week long brave young people have risked arrest and deportation just to demand Congress vote on the issue. They shut down the Cafeteria today, in solidarity with seven other activists who went on hunger strike in jail. And still, Congress lacks the courage to protect people, not polluters. One other wrinkle to this week’s tax bill that you might not haver heard about: The #GOPTaxScam effectively eliminates the tax deductibility of charitable donations, removing the incentive for most people to donate to groups like us. I know that a lot of you will still donate because you care about the mission, not the tax break. But no less than New York Attorney General Schneiderman estimates groups like us could lose $20 billion in 2018 alone. Can you chip in to support our work before these stupid new rules take effect so we (and you!) can afford to support climate activist? Here in the darkest hour, it’s also worth remembering the lesson of the solstice: that darkness and light move in cycles, and just when it can’t get any darker – the light starts to come back. It wasn’t just California of course. Much of Puerto Rico is still without power and the death toll hundreds of times worse than the Trump Administration admits. We need to build local resiliance and resistance efforts from coast to coast to coast (there are three in America – Pacific, Atlantic, Gulf). 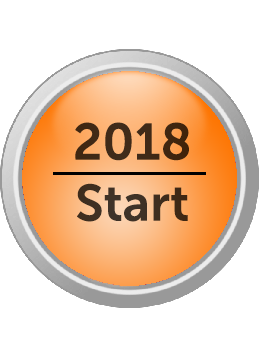 Click here to chip in to support our local community building efforts in 2018. If fire and water aren’t enough to get your elemental on, how about some atmosphere? Here’s a time lapse showing how carbon Dioxide moves in our atmosphere – if you look close you’ll notice that the rainforests in the global south act like a pair of lungs, constantly inhaling carbon and exhaling oxygen. But the global north is like a chain smoker, filling the shared resource of our atmosphere with more than our share of (red) Carbon and other global warming pollution. Click here to support our work to slash pollution, stop the expansion of fossil fuel infrastructure, and build out 100% clean, green energy here in North America. Finally, today is a good day to donate because it’s the solstice. The longest night which turns into a long series of lengthening days, each one a little brighter than the day before. 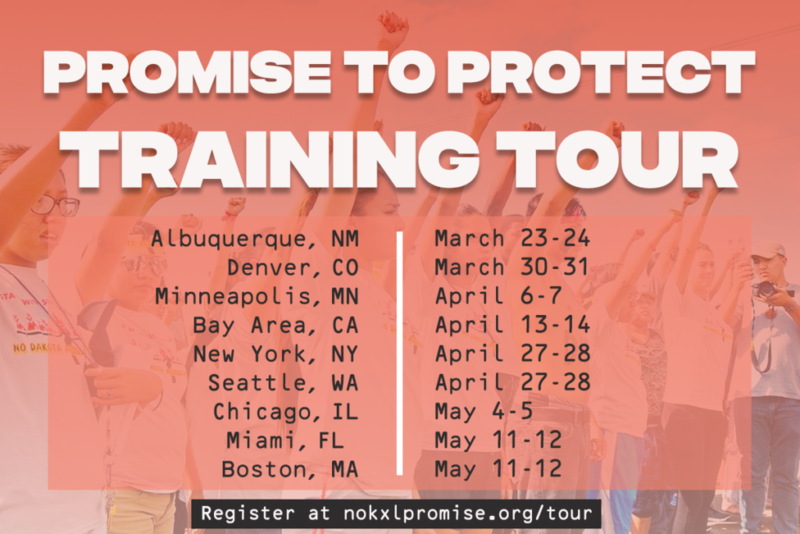 For the next six months we’ll be traveling the east coast – meeting up with frontline activists in the Carolinas, Virginia, DC and points north. We’ll keep a watchful eye on the Bayou Bridge and Keystone XL Pipelines – which thousands of us have signed up to show up and block, if and when we’re asked by local leaders. Do we demand a target that protects the most vulnerable (closer to 1.5C and serious action by 2020, instead of 2C and 2050)? 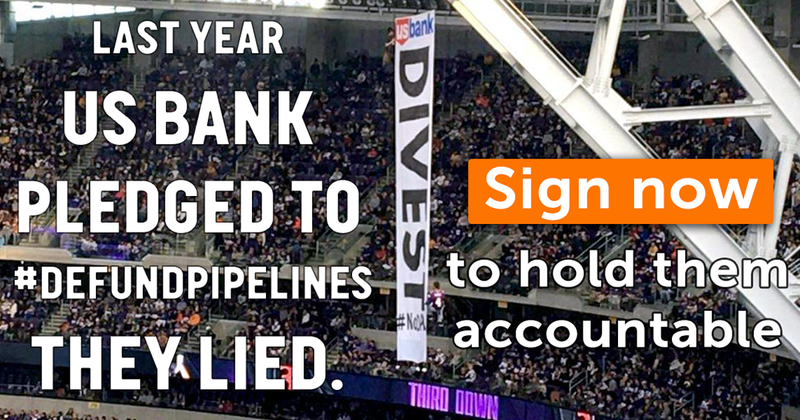 Do leaders enact binding action, like state, county, an state-wide bans on new pipelines and fossil fuel infrastructure; Or do we let them get away with another promise to do better? Are conversations lead by communities on the frontlines that are poor, led by People of Color, and otherwise hit first-and-worst by climate impacts; Or does former-Mayor Bloomberg talk about sea walls in Brooklyn, while JP Morgan Chase is talking about not funding pipelines someday. (hint if Bloomberg and JP Morgan Chase are talking, the conversation is not about climate JUSTICE, even if it is about climate CHANGE). So click here to chip in $1.98, $19.80 or whatever you can afford to help us get ready for 2018. Because today may be dark, but it only gets brighter from here. PS – All the images and gifs in this message are from NASA’s Earth Observatory program. I mention because you should totally check out ALL their amazing and beutifle videos and images. But also because they’re yet another science-based program that (you guessed it) is set to have their budget radically cut by Trump and Republicans in Congress next year. 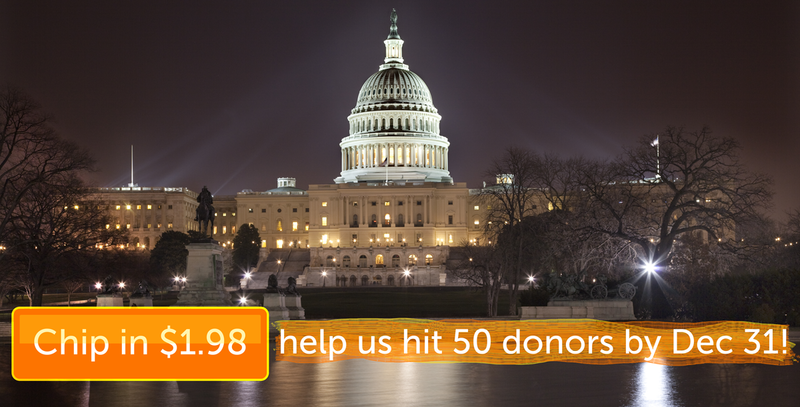 We’d also love your financial support so we can incorporate a C4 arm that can lobby Congress directly, advocate for and against candidates, and more. Next week I’ll be sending you more of a roadmap and plan for 2018. But in the meantime, Please chip in to support our work. Taking action while waiting for Keystone. I hate waiting for news. And this morning, we were waiting on a doozy of an update: A few days after a massive oil spill on the keystone 1 pipeline, the the Nebraska Public Service Commissions (PSC) was to decide whether or not to approve the Keystone XL pipeline route. (See this post if you want to catch up on the spill.) They did, with a really important caveat. And now I’m thinking about what’s next. But as fortune would have it, I wasn’t stuck home alone, worrying about the vote; Or out at work trying to stay busy while clicking the refresh button on my news feed every few minutes. I was in Pittsburgh at the People Vs Oil & Gas conference, surrounded by pipeline fighters from British Columbia, Canada, South Texas, New York, California and everywhere in between. 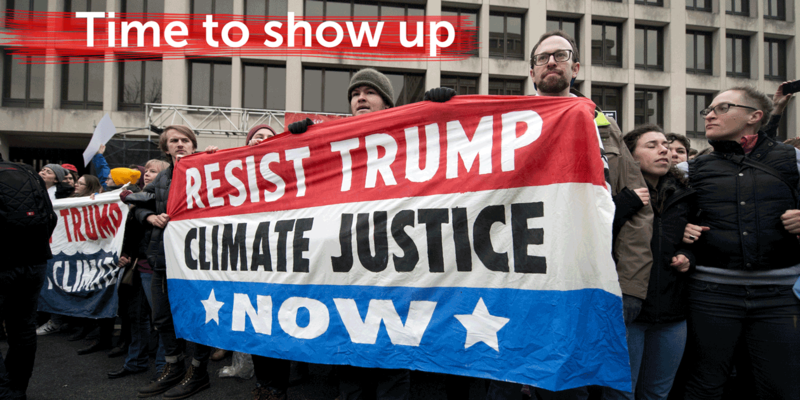 So when a couple friends from the local Rising Tide chapter asked me to pitch in (and do what 198 methods does — digital communications support for direct action campaigns), I said yes in a heartbeat; Even if it meant getting up really, really early this morning. Which is how I ended up holding my cellphone with shivering hands to film, tweet and share a cold, late November morning from Southpointe, PA. I was there to support a brave group of 5 local activists, each of whom had been touched directly by the fracking, coal mining, and extraction industries that have run roughshod over the shale fields and coal fields of that part of western PA, West Virginia, and too many of our communities. In freezing weather lit by headlamps and watery pre-dawn light they erected two twenty foot tall tripods, dangled themselves from the apex and locked their bodies to the base. All of it to block an entrance to a local office park that is home to some of the biggest, richest and most destructive fossil fuel extraction companies in America. Frackers, Pipeline builders, Injection well profiteers and petro export barons all rub elbows and share office space on the plush Southpointe campus. Heck, even Halliburton rents a suite there. I think it was a really perfect Counter-pointe to the waiting. 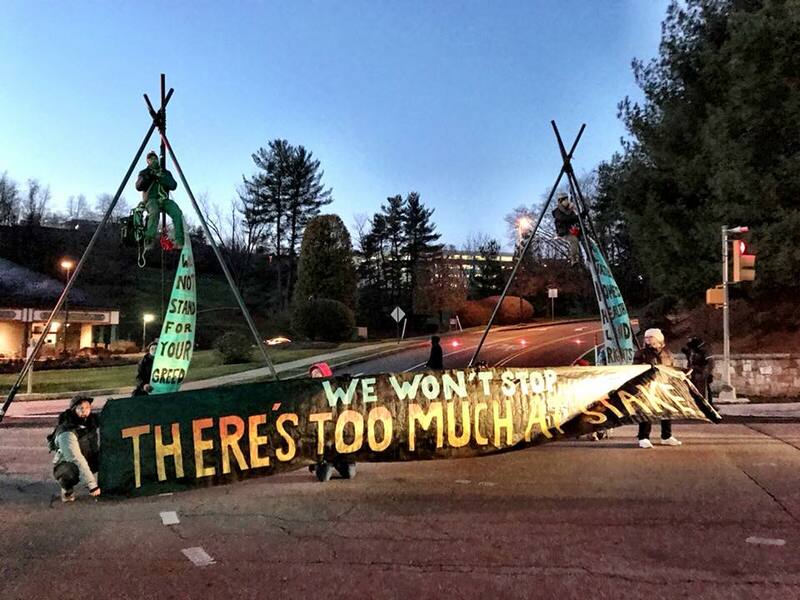 While the drillers, frackers and polluters showed up expecting “another day at the often” we did something beutifle, creative, and a little bit crazy to disrupt their morning commute and make it clear #WeWontStop. You can read all about it, and check out my epic, shaky-shivering, 3.5 hour live stream of the whole action, at the Rising tide Facebook page. You can also chip in a few dollars to support the legal defense fund of the two climbers who were arrested here. And that’s how it needs to be with Keystone XL too. Today’s decision isn’t a defeat — for us or Transcanada, the pipeline builder either. It’s a sort of detente, a “game on” moment that we need to rise to with creativity, love and a powerful spirit of action. You don’t need a giant tripod or a beutifle banner, or even to run out in the street and stop traffic where you live (yet). But you DO need to be willing to speak up and take action when the moment is right. And that’s why we’re encouraging everyone to sign the “promise to protect” today. Lead by Nebraska landowners and local tribal nations and indigenous leaders, the promise asks you to be ready, to get trained, make a plan, recruit some friends. And when the moment is ripe as a late-July ear of corn, to be ready to take action to protect our country, our communities, and our climate from the Keystone XL pipeline (or whatever else they think of). Will you sign on? The Decision is BAD because it’s basically saying the Keystone Xl pipeline can get built, despite all the protests, problems, and last week’s massive oil spill. On the other hand it’s GOOD because the “alternate route” they approved is hundreds of miles longer and needs new and different land to be taken by eminent domain — none of which has been vetted by the EPA and other federal agencies before.That gives us an opportunity to sue, demand more information, and otherwise gum up the works until they do. Because of all that, and the fact that the price of oil has been crashing (undercut by the price of renewable energy, but mostly by cheap fracked gas), a lot of economists and investors think that KXL will simply never be built. 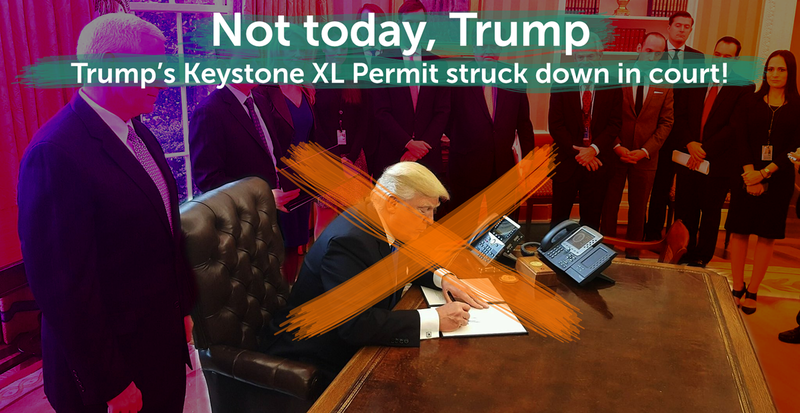 For now, the best thing to do to help is to dig in and get ready to fight this pipeline (and lots more like it) with everything you’ve got. And you can start with the Promise to Protect. Together, we can stop all of the pipelines, export terminals, compressor stations and more. But only if we promise to take action.